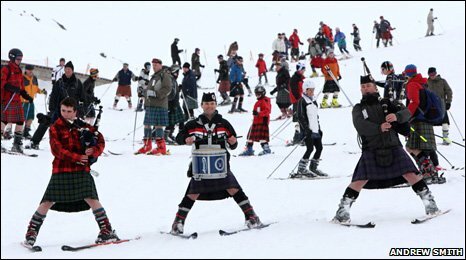 More than 200 skiers and snowboarders have set a new "world record" for the most people in kilts going down a piste. Participants came down in a line from the Ptarmigan Top Station on CairnGorm Mountain, near Aviemore. Money raised from the event will go to charity and a schools skiing programme. A totals of 235 intermediate and advanced level skiers took part in the attempt, which organisers described as a "fantastic spectacle". The record bid came during the best ski season in Scotland since 2001, according to Ski-Scotland. More snow has been forecast, meaning the season could last through to May. CairnGorm Mountain spokesman Colin Kirkwood said: "We're delighted, it was a little cloudy overhead but it was a fantastic spectacle and people really enjoyed taking part. "It was an impressive sight and we wanted to do something to celebrate the great ski season we've been having and do something which could involve the public." The event was the first attempt to set a record and was led across the finish line by two pipers and a drummer. The pic shows a few not into the event without tights under their kilts. Whimps right? !